The packaging procedure is supervised by our experts holding immense domain experience. Moreover, we make use of only quality packing material for ensuring complete safety of the orders during transit. We are committed towards providing quality-assured products and thus we keep a strict check on the production procedure. 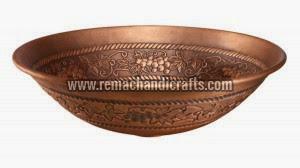 Sink Material - Copper Made of solid, 16-gauge copper.